Perhaps nothing exemplifies a nation’s identity and culture more than its traditional cuisine. Among the highlights of Washington DC are the many cultures represented among its host of communities, international organizations and embassies (more than any other city in the world). 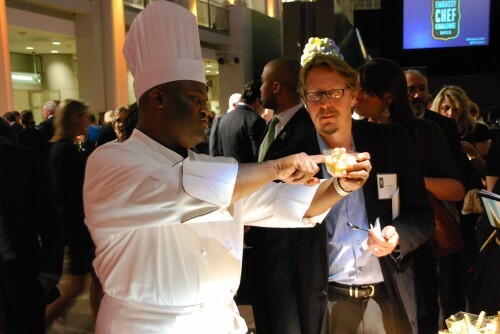 Unbeknownst to most of us, hidden talents are creating culinary masterpieces behind the walls of Washington’s embassies. These embassy chefs are themselves cultural ambassadors, sharing their national dishes for state dinners and other events, without the media attention or fanfare of other top restaurant chefs. 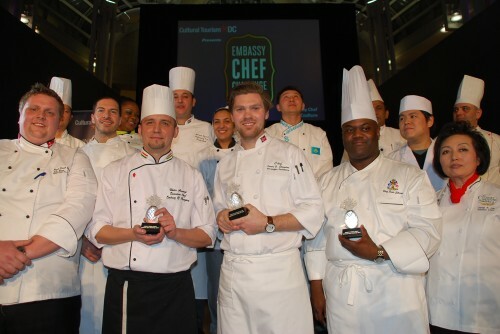 The 4th Annual Embassy Chef Challenge, sponsored by local non-profit Cultural Tourism DC, culminated in a fun and flavorful fundraising event Thursday night at the Ronald Reagan Building. Cultural Tourism DC promotes the cultural treaures of Washington through a host of events, neighborhood heritage trails, culture events for kids, the month-long international festival Passport DC and more. Thirteen chefs competed for the Judge’s Choice Award, for which celebrity judges combined the rating of this evening’s dishes with those of a head-to-head private cook-off that was held on February 12. 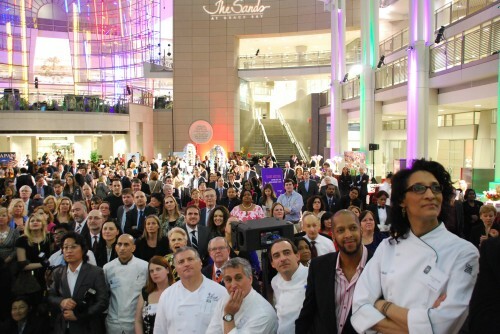 On Thursday, around 600 guests were treated to hors d’oeuvre portions of a chef’s choice, and each guest was allowed a vote for the People’s Choice Award for the evening. In addition to the tasting stations, a silent auction of donated items allowed attendees to bid for cultural activities, getaways and memorabilia. Taking home the Judge’s Choice Award was the Embassy of Hungary’s Viktor Merényi. 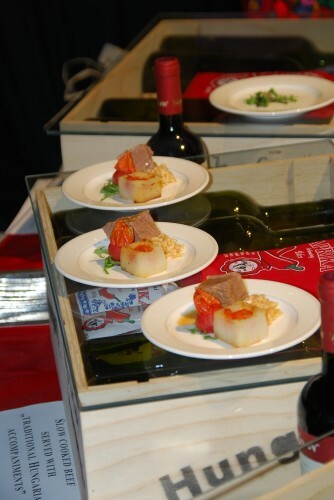 Merényi showcased a cube of slow-cooked beef alongside a cube of potato stuffed with tomato. The gorgeous presentation, along with a delightful Hungarian red wine brought to life the chef’s artistry. Chef Viktor Merényi's winning dish Slow-cooked beef served with Hungarian Accompaniments. Photo by Don Tanguilig. Buzz for the coveted People’s Choice Award seemed to be neck and neck all evening between the embassies of the Bahamas and Switzerland. When the emcee announced the 20 minute warning until voting ended, queues rapidly returned at these tables for a chance at second helpings. Certainly not everyone can attend an expensive fundraiser event, but luckily for us, often throughout the year, an embassy may offer chances to sample some of a country’s culinary culture along with its political and social culture. Some of these events are available with a nominal entry fee while a number are free of charge. I find these primarily via Cultural Tourism DC’s International DC program, Embassy Events and the International Club of DC. Musical events at embassies can be found at Embassy Series. When friends or family come to town, I make it a point to check out the current events at embassies for the chance to share in a truly unique experience for visitors. One year, I visited at least 20 embassy events, and some club members double that amount! But on this night, the gracious chefs and their support teams were able to share their talents with the public in what was truly a tasty spectacle. 2012 Competing Embassy Chefs at Cultural Tourism DC's Embassy Chef Challenge. Photo by Don Tanguilig. Embassy of Switzerland – a curry carrot custard seasoned with cardamom and star anise. This savory morsel was a perfect primer for the caraway encrusted smoked veal slice, gracing the plate with a garnish of carrot greens. Embassy of Georgia – a tahini-like puree of walnuts, saffron, cilantro, and a variety of Georgian spices had diners conjuring up ways to lick their plates in a dignified fashion. Fortunately the sauce was liberally applied over a medallion of turkey and slice of fried cheese. Embassy of Iraq – a commonly heard grumble was this beef kibbeh that had probably been sitting in its warming tray for many hours. Overheard nearby: “It’s like a frozen kibbeh from Trader Joes, but the Trader Joes one is better.” Ouch. Food, Wine & Beer. I loved DC so much for college (Go Hoyas! ), I returned here after a 10 year safari. I’m comfortable on both sides of the bar, and in or out of the kitchen. You could say the Whimsy Truck skipped me, but that’s probably just because I was checking out a food truck at the time. Oh, and you definitely want me on your trivia team. I agree about the Georgian sauce, very flavorful! Too bad about Iraq! I couldn’t try it since I’m vegetarian. Food, Wine & Beer. I loved DC so much for college (Go Hoyas! ), I returned here after a 10 year safari. I'm comfortable on both sides of the bar, and in or out of the kitchen. You could say the Whimsy Truck skipped me, but that's probably just because I was checking out a food truck at the time. Oh, and you definitely want me on your trivia team.